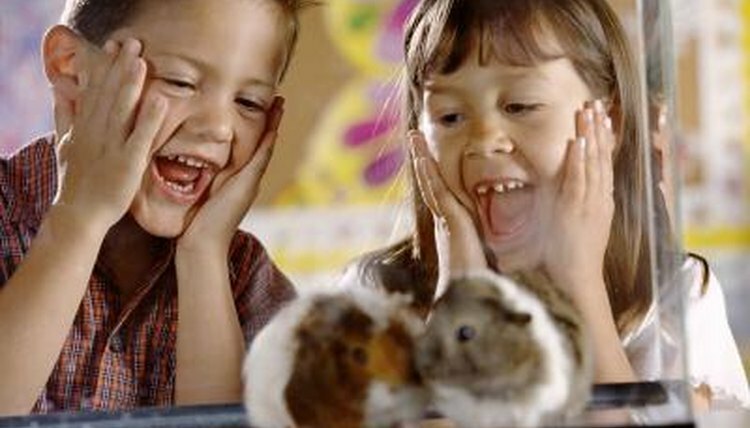 To remain happy and healthy, hamsters need fun, stimulation and exercise like any other pet. A hamster wheel is a must-have accessory your little pet will love to play on and that provides a primary source of physical activity. Other toys and accessories that entertain and exercise your hamster are also good choices. Remember to occasionally rotate the items your hamster plays with to prevent boredom. Hamsters love to run on exercise wheels. This is the main source of exercise for pet hamsters, who can't walk around the neighborhood or run around the house. Buy one that attaches to the side of your hamster's cage if possible, as others sometimes have potentially dangerous cross supports. Choose one with a solid or mesh bottom, rather than rungs; little hamster paws can get stuck in between wire bars, possibly resulting in serious injury. Pick a wheel that's large enough that your hamster's back isn't arched while she runs. When locating your hamster's cage, keep in mind that exercise wheels can be noisy and your hamster will use it overnight. Chew toys serve dual purposes: they provide amusement, but they also provide a surface for your hamster to gnaw on. Chewing is important for hamsters and other rodents because their teeth grow continuously. Gnawing keeps the teeth filed down. Buy a few chew toys sold specifically for hamsters. Untreated, unpainted pieces of wood are good options, too, as are walnut shells or bits of hard dog biscuit. Your hamster will chew when she needs to, and she'll have fun playing with her chew toys and burying them in her bedding. Tunnels are a great source of amusement and exercise for hamsters. They'll play for extended periods running through networks of tubes when possible. Cages with attachable, customizable plastic tubes and extra compartments conveniently provide your pet with plenty of tunnels to explore and play in. Purchase extra sets for more fun, and you can even use them to attach a second cage for a more spacious habitat. PVC pipes, empty paper towel and toilet paper rolls or cardboard oatmeal containers with the bottoms cut out also work well for DIY tunnel networks. Hamster balls are fun sources of exercise. Pick a ball with holes for ventilation, but make sure your hamster's paws can't fit through the holes. Because hamsters don't see well, opt for clear plastic. Use a small piece of tape to secure the ball's door, as they sometimes fall off. Seal off the room and make sure your hamster can't inadvertently fall down any stairs. Place the ball on a carpeted floor, as the ball can move too fast on hard floor surfaces, causing your hamster to get flipped over. Remove small children and other pets from the room, too, so they don't kick or bat the ball around. Limit your hamster's time in an exercise ball to 20 minutes; she needs access to water and the ball can become stressful after a while. If your hamster appears stressed, remove her from the ball.